Preschool is a season in life where children are exploring the world around them, discovering things, and growing fast. 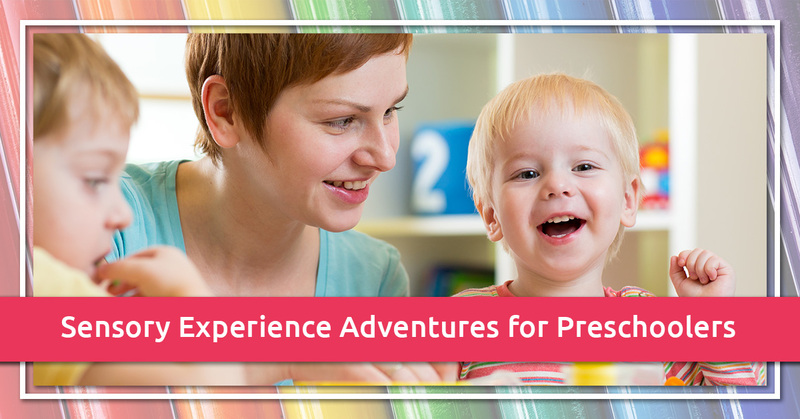 In preschool, there is an almost unlimited amount of ways that children can be encouraged to explore. Here are some tips from our preschool-age daycare program in Huntington for how to give children sensory opportunities in a way that’s easy and fun for them to experience. This classic preschool activity is fun for the kids and friendly for your home and their clothes. Seat your child at the table and squirt a generous pile of shaving cream on the table in front of them. Then encourage the child to touch it, squeeze it, spread it out, scribble with their finger in it to make pictures, and enjoy feeling it. Keep the activity to 10-15 minutes or less, and move on to the next activity before you see any signs of boredom. Taking your child to a petting zoo can give them many sensory experiences that they may not otherwise be exposed to. For example, the White Post Animal Farm is a great place for your preschool-age child to be exposed to the chance to touch the velvety nose of a zebra, stroke the hard horns of a goat, or experience the grasping feet of a little bird around their finger. One of the most memorable and fun experiences you can have with your preschooler is to make a batch of yeast bread together. When the dough is ready to be formed into loaves, give your child a fist-sized lump of dough and allow them to stretch it, squeeze it, roll it into a snake, and shape it into little balls. Depending on their age, you could show them how to roll several balls that make the shape of a teddy bear face and stick raisins into the dough for the eyes and the nose. If they’re not quite ready for that level of artistry, allow them to push their ball of dough into a greased ramekin dish or tart pan, and when it comes out of the oven, allow them to eat their own creation (spread with peanut butter and jelly, if desired). It’s a healthy way to bond with your child at the same time as giving them an awesome sensory experience. If bread dough isn’t quite your thing, there is always play doh. Some parents hate play doh because it just seems to make a mess, but if you create a bit of structure and guidance around the play doh experience, the kids will have a better time, stay engaged longer, and develop a deeper artistic expression as they discover that they can model the 3-D shapes that they envision. Start with simple snakes and balls, and move up to more complicated models, like a long thin snake that they wind into a spiral to make a rug, or a play doh bowl that they fill with play doh “peas” and then pretend to feed them to a stuffed animal. Sensory experiences are an important part of early childhood education, and here at Rainbow Chimes, we are committed to your child’s well-rounded development. Schedule your free walkthrough tour today!